Human communication progresses in three primary dimensions – relation, distance and fidelity. Relation is about how we are connected. 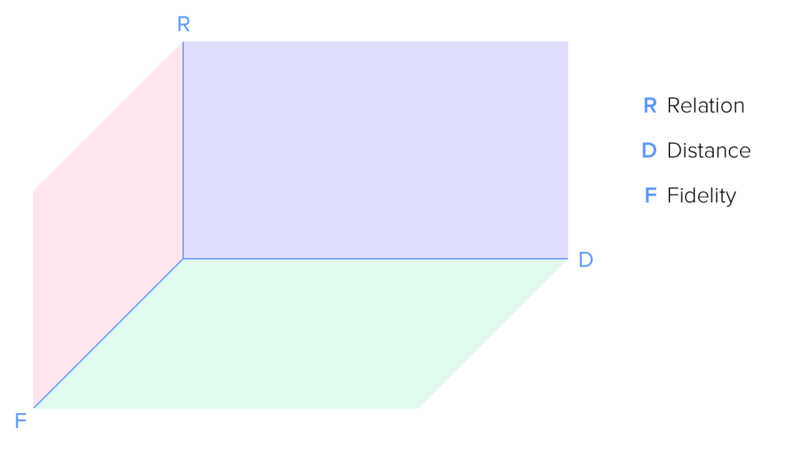 The simplest network is a direct line between two nodes. A face-to-face (one-to-one) dialog for example. A speech is one-to-many. A campfire is many-to-many. With the Morse code, we conquered distance. The telephone allowed us to converse with somebody far away as if he was near. The internet grew similarly. Email started as one-to-one. Then came the web and people used websites to distribute information. Then came social networks and multi-player online games. Technology created the screen. First it was moving pictures, then came color. Next came touch interfaces. The fidelity of our media is the most observable dimension for it touches our senses directly. Despite new media’s advances, it is still pretty much passive. Most online media consumption are either passive like watching a YouTube video or boringly low fidelity like commenting on or liking one that a friend had posted. Most people are lazy and boring but most are social. Media is entertaining but mostly passive. Social media is our current attempt at marrying the two – social people sharing entertaining things. But that’s not real integration. Boring people who share stuff are still boring, shared entertainment is still passively consumed. How would truly connected rich entertainment look like? Perhaps it is like an MMORPG (Massive Multiplayer Online Role Playing Game). Instead of consuming the pre-made story of a book or film, one writes his own story in an MMORPG. But life as a character in a book with a good story is usually more interesting than a one in an MMORPG whose typical day mostly involves drudgerous hacking and grinding. Books are on the rich but passive end of the spectrum. Multiplayer games are on the other end of being interactive but haphazard. How can we make use of technology to deliberately design a truly interactive system that connects many people’s consciousness in a plot that flows like a book with some sense of a story? 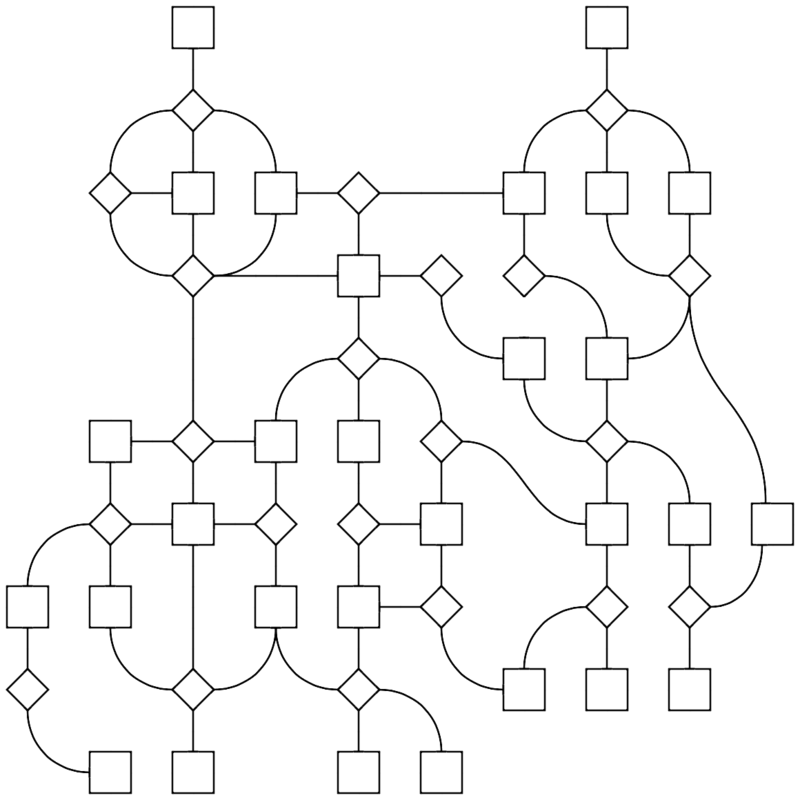 In a “massive” multiplayer network, the interactions between nodes in such an unstructured graph can only be primitive. One either engage the AI or other players in simple power play – dressing and leveling up, forming groups, killing monsters and each other. One can only affect another player this much. Compared to multiplayer games, one might find reading a lonely affair, albeit compensated with better storylines. The author has full control over the characters and events in the book. Which is why we carefully choose our favorite authors to invest our attention in. What if we take some of that control away from the author and allow the reader to decide who he wants to be and what he wants to do in the book? Instead of the boundless freedom of choice in a MMORPG, you get choices. Much like the choose-your-own-adventure books that were popular when millennials were kids, except in a grander scale with hypertext. A typical choose-your-own-adventure book works like a decision tree. With each decision you choose to make along the way the story branches until you reach one of the endings. The scale of the tree is obviously by limited how thick the paper book can be. Each branch contributes more exponentially to the complexity of the tree the earlier it occurs. This is not feasible with a book made of paper. It’ll have to be online. Now imagine that a reader can choose to be any character in the story. At any point in the book, the events are premeditated by the prior decisions of an instance of a character played by another reader and your actions is going to determine how another reader’s story will play out. With each juncture, your story is matched with someone else’s so your fates intertwines. With a tree like this, there will be multiple endings and not every branch will lead to an ending. Some unfortunately lead to the demise of a character. Perhaps only a few branches for each character will lead it to one of its favorable endings. Like how you may still be fatally struck by lightning in real life despite living healthily, your encounters are out of your control so you will never have ultimate control of your fate. Weaving the consciousness of many people like this opens up endless possibilities for interaction. Since every character in the book is “alive” with the exception of those not controlled by readers, you can communicate with the character to influence its decision, for example. Imagine talking to a character in a book? Not only is this technically daunting. It’ll take a writer not a technologist to come up with a compelling story that needs to be dendritically morphed into a sensible network of interwoven cause and effect. I may be overestimating myself but I think I have the technical and architectural sense to pull the mechanics off. When it comes to writing a story I haven’t a clue. Maybe I’ll try developing the mechanics first. Techies, does this sound technically feasible? Writers, do you think I’m crazy? Leave a comment below or at Hacker News.